"The world is closing in on the few remaining people who live in such remote isolation as to seem not of this world. They dwell in crude thatched huts in forest depths and subsist by hunting and fishing and gathering plants and berries. They know nothing of television, the Internet or, it is safe to say, the Big Bang. But some have seen airplanes flying over, sometimes swooping low over their settlements. 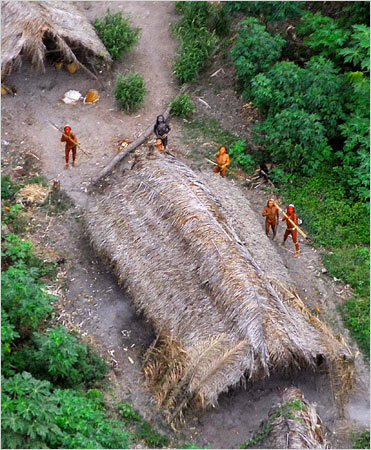 A reminder of their situation came recently with the publication of aerial photographs of the encampment of a tribe in the upper reaches of the Amazon River in Brazil, near the border with Peru. The pictures showed a line of neat huts and people looking up at the small airplane. Two men, their faces and bodies painted red, raised bows and arrows as a pointed warning to the intruder. As survivors whose continued survival is very much in doubt, these last primitive tribes hidden away in the planet’s most remote reaches pose a dilemma for their would-be protectors: whether to leave them to their fate or to assimilate them into the larger world before they are extinguished. Neither course promises a happy ending."